Game orchestration is the live creation of experiences for players in digital games. Commercial examples include guiding players through a story using “dungeon master” mode in Neverwinter Nights, or live events in Asheron’s Call. Game orchestration allows free-form creation of gameplay that is not restricted by the game’s pre-programmed behaviour. For example, an orchestrator might dynamically create locations for players to explore, characters for players to encounter, and might animate the interactions between players and these characters. Game orchestration requires tools allowing the very rapid creation and manipulation of game content. Game orchestration is also an inherently collaborative process, where two or more people might split up aspects of content creation and animation. We hypothesize, therefore, that game orchestration is a natural fit with tabletop computing, which supports direct gesture-based interaction. We are currently prototyping a surface-based tool for game orchestration. The tool allows one or more orchestrators to manipulate the contents of a game world, allowing real-time modification of the world as perceived by people playing the game. Graham, T.C.N., Schumann, I., Patel, M., Bellay, Q., and Dachselt, R. Villains, architects and micro-managers: what tabula rasa teaches us about game orchestration. Proceedings of the SIGCHI Conference on Human Factors in Computing Systems – CHI ’13, ACM Press (2013), 705-714. T.C. Nicholas Graham, Quentin Bellay, Irina Schumann, and Amir Sepasi. 2012. 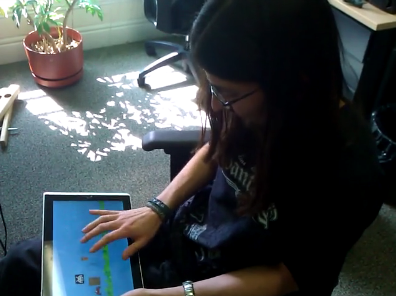 Toward game orchestration: tangible manipulation of in-game experiences. In Proceedings of the Sixth International Conference on Tangible, Embedded and Embodied Interaction (TEI ’12). ACM, New York, NY, USA, 187-188.